Leicester Falcons are proud to announce that next season the Falcons Academy will restart an Under 19 team. 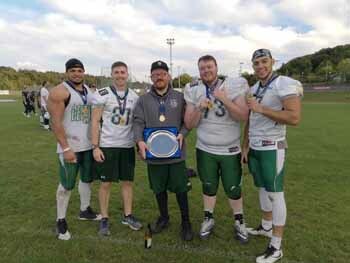 The squad will be led by Rob Urquhart, who brings a considerable wealth of experience to the role, having worked with the GB Lions U19s and is the current head coach of Leicester Longhorns university team. This means that the Falcons will now once again cater for young people from the age of 14 all the way through to adult football for the first time since 2014. Rookie sessions will take place at Fullhurst College on Saturday 17th November (10am) for Youth football (14-16) and Sunday 24th November (12pm) for Junior football (16-18). No experience is necessary and kit will be provided, you only need boots and a mouthguard.